Here i am writing this article to explain how to export gridview to Excel & Word file in asp.net. Step-5: Add a Webpage and Design for Show Data in Gridview. 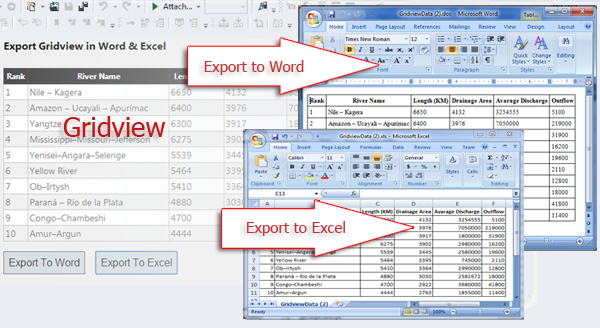 Step-7: Write below code in a function for export data from gridview to Excel/Word File. Step-8: Write code in button_click event for export gridview to Word file. Step-9: Write code in button_click event for export gridview to Excel file. And this function is also required to add. This is required to solve this problem --> Control 'MainContent_GridView1' of type 'GridView' must be placed inside a form tag with runat=server.